Since last few days a post on ways of worshiping Baba was knocking on the doors of the mind. In last post of Miracles of Sai Baba , it was mentioned about Baba appearing in the dreams of devoted hearted people and guide them. Today i received a mail from a Buddhist devotee from Sri Lanka. Below one can read the wonderful experience of the devotee in whose dream Sai Baba appeared. I am a 36year old male from Sri Lanka. I am a Buddhist. Couple of days back In my dreams I was worshiping a temple covered by huge trees by the ocean. There were my wife and few other friends. When I came closer to the temple I saw a statute covered with white material. So I lifted the material to see what is in side, then I saw Sai Baba's statute in it ( Only couple of days after I realized it was Sri Sai baba coz I knew very little about him) so I was worshiping him with my wife while looking straight in to the eyes of the statue. In seconds, eyes of the statue opened and smiled at me, after that the statute got down to the floor and wanted me and my wife to follow him out of the temple. So, me and my wife followed him and went out of the temple. Ever since then, i wanted to be a devotee of Shirdi Sai. I came across your e-mail address while searching via google for Shirdi Sai Baba's information. Please let me know how I should worship him. Is it o.k if I keep a picture of Baba next to Lord Buddha and worship him everyday in the morning and evening? Wow, you are a blessed soul Diluka Abeyagunaratne. Since Shri Sai sported in body there are many devotees who did not knew anything about Baba. Now really there are many ways of worshiping Sai Baba and in this post we will read most popular ways. The right way for you would be the one you are attracted to. The writer always pray before the picture of Shri Sai, meditate on Baba, and ask Him or His grace to write through the writer. Few days ago, while the writer’s daily worship, he asked Sai Baba to write about the ways of worshiping Him, as many devotees are looking for it and the post could be of guidance to them. Here it is worthy to mention that she had tremendous love and devotion for Sai Baba. She was very poor in material wealth. She survived on the alms given by the devotees that visited Shirdi. She would bless those who gave her alms. The blessings of her remained the same for all, "You will remain a married couple all your life. You will have 5 grandsons. You will be happy and my 'Shai Baba' will bless you. She used to call Sai Baba as Shai Baba. Baba accepted garland made by with love and devotion by her and would keep the garland around his neck whole day. At times she would collect wild fruits from forest and offer the fruits to Shri Sai as prasad or naividhya. Baba would accept the same because of her intense love and devotion. Number of devotees visited Shirdi during that time and plenty of garlands, rich food and other things were offered to Him. Sai Baba would accept the offerings from those who had intense love and devotion for Baba. Materially rich or poor did not matter at all. "Keep calling me Shai Baba Shai Baba all the time day and night." This last sentence said to her by Sai Baba speaks volumes about ways of worship or devotion to Him. It points to the intense love and devotion towards Sai Baba. It does not matter even if you cannot pronounce His name in the right way. Spiritual journey with Sai Baba is not a dry one. It is a love affair. We feel a love relationship with Him. He is not just a guide on spiritual path. He is there with all His love and compassion, which we feel when we are devoted to Him. He is a Father, Mother, friend in whatever way we see Him. A statement of Sri Ramakrishna in Gospel of Ramakrishna comes to mind. It is enough to have yearning for God. It is enough to love Him and feel attracted to Him. Don't you know that God is the Inner Guide? He sees the longing of our heart and the yearning of our soul. Suppose a man has several sons. The older boys address him distinctly as 'Baba' or 'Papa', but the babies can at best call him 'Ba' or 'Pa'. Now, will the father be angry with those who address him in this indistinct way? The father knows that they too are calling him, only they cannot pronounce his name well. All children are the same to the father. Likewise, the devotees call on God alone, though by different names. They call on one Person only. God is one, but His names are many." Above we have seen most important factor of Worship. Now let us see some mode of worshiping Sai Baba of Shirdi, not forgetting that deep love towards Him. You have asked, "Please let me know how I should worship him. Is it o.k if I keep a picture of Shirdi Sai baba next to Loard Budhdha and worship him everyday in the morning and evening?" As stated above in the quote of Sri Ramakrishna. God is our inner guide. You have already been guided by Baba. The answer is present in the question itself. You should be doing what your heart has said. Keep a picture of Shirdi Sai Baba next to Lord Buddha and worship him everyday in morning and evening. 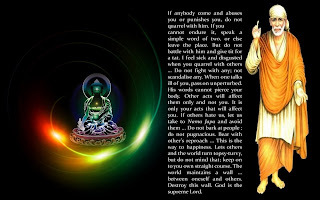 Some points that might be helpful in worship of picture of Sai Baba. This points are just a guide and there should be no strict following in every one of them. Do what the heart tells, first we have look for the inner attraction, the inner love. Love is the most important aspect in worship. It should not be felt as daily core or duty. Sai Baba loved oil lamps and fire. So oil lamp lit during the worship would be great. Some devotees (including the writer) keeps an oil lamp lit day and night in front of Baba's picture, More important is the light of remembrance of Baba or God in our heart. You may like to read Constant remembrance of God. 3. Applying Chandan Tilak to Baba's picture. 4. Offering flowers and garlands to Shri Sai's picture. 5. Performing Aartis of Sai Baba. 7. Chanting Sai Baba Mantra or Chanting His name. Reading of Sai SatCharitra if you don't have a hard copy we will be glad to send the Sai SatCharitra and Baba's Udi to your home for free. All you need to do is send an email from the linked post. alpesh bhaiya...new URl...bahut aacha hai!! baba sai of shirdi bless u always! Experience of Gopakumar, Assistant general manger of Visakhapatnam steel plant. I, Gopakumar ,a civil Engineer was working under one Sri R.B. Verma in Visakhapatnam steel plant in the year 2005 .I was traversing through a bad period called 7 ½ years of Saturn .R.B Verma , though a Shiva Bhaktha ,was a self centered , high handed and proud man . He used to humiliate and harass the officers working under him who resisted his wrong directive or came on his way. All this he used to do with great cool and cleverness. Once I became a victim to his high handedness. He withdrew and transferred the entire works under my control with the reporting staff to another officer only to humiliate and harass me in front of my juniors. He assigned me certain lower jobs which needed going round and collecting data from my junior staff reporting to other officers. Harassed and humiliated, I took total refuge in Baba and started his Darshan and namaskar on his feet daily in the nearby sai temple to ease my mental agony. I decided to remain cool and to wait patiently as time solves all problems. I prayed before Baba that I will come to shiridi for Baba’s Darshan . Later I got transfer to another section and my problems were eased. Almost after a year, I was on my way to shiridi by Train for Baba’s darshan via pune .En route, I got down from the train at Pune to meet my daughter who was studying there .It was midnight .I have to spend the night in the railway station till morning to go to my daughter’s place .So I went to the waiting room of Pune station and locking my suit case with a chain to the Rack, I slept on a bed sheet spread on the floor. At about 5 a.m , I woke up feeling some body calling me and on opening the eyes I saw Sri Verma standing right in front of me . Surprised he was and calling his wife, he was telling her .Look , who is this , Gopakumar! I was surprised to see my one time enemy in front of me. Who woke me up? I asked Verma where he was going. He told me that he is en route to Shiridi for Baba’s Darshan and I too was on the same mission though I did not tell him. My surprise knew no bounds .Praises to Baba. What a miracle! The harassed (myself) and the person who harassed and humiliated me had been together called by baba to shiridi for Darshan on the same day .Both of us met en route and did darshan on the same day. I did not tell this miracle to any one for quite some time till recently. This miracle is dedicated to Baba. Baba’s will prevails. I beg Baba to bless my daughter swathi and her husband Atul and to bond them with love. This experience is placed at the feet of Baba to add as a new chapter to sat charita. Have faith in Baba and Sai SatCharitra, Leave the results to Baba as he knows best. I like Shree Sai Baba to come my dream. I am really having hard time in my family especially financial whereby I have come to extend to dispose of my house to settle my debts. 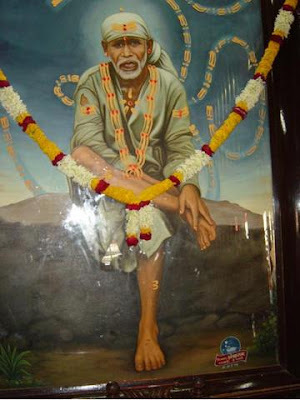 Iam a devotee of saibaba since my school days. Once I've read in internet that Sai Baba thanked Russians for their ancestors brought Vedas, Divine wisdom and mundane skills in India when they visited it thousands years ago. Is it true? May i please know more about it? baba please help me in writing my tomorrows HCI exam well and good and score maximum marks without any backlogs.baba if saying so is wrong please forgive me,do not get angry on me. baba ,i request you to please fulfill my wishes.also help me in getting qualified in ISRO exam if the job suits me.Baba please forgive me for my mistakes that are done by me with and without my notice.Baba please you be with me and within me always.i hope baba you will definitely help me by fulfilling my wishes. i am a muslim.. how should i worship sai baba.